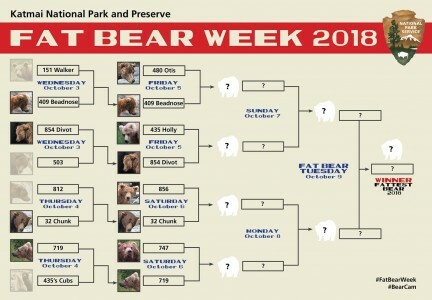 The polls have closed on Fat Bear Week round one and the competition just keeps getting bigger. During Fat Bear Week, you can vote for the bear you think is the fattest bearcam bear of 2018 (learn more about how to participate). 409 Beadnose, 854 Divot, 32 Chunk, and 719 have advanced to the quarterfinals where they face even larger competitors. Each bear illustrates a different story of what body fat can mean for their survival and reproductive success. Here’s your preview of the Fat Bear Week quarterfinals. On Friday, October 5, some of the river’s oldest and most experienced bears meet. 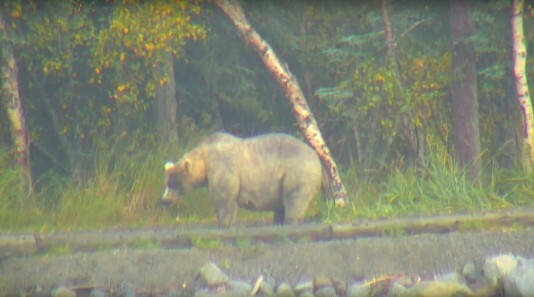 On Saturday, October 6, Brooks River’s most dominant bears appear. The people spoke clearly when they resoundingly chose Beadnose’s portly proportions over 151 Walker in round one. But, 480 Otis is a three-time Fat Bear Week champ. This could be one of the most competitive matchups of the tournament. 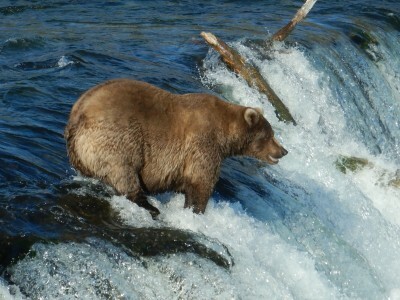 480 Otis endeared himself to bearcam fans with his efficiency and fishing skills. Despite missing and worn teeth, Otis has gained a substantial amount of weight over the summer. He’ll need that fat to sustain him through the winter and spring. 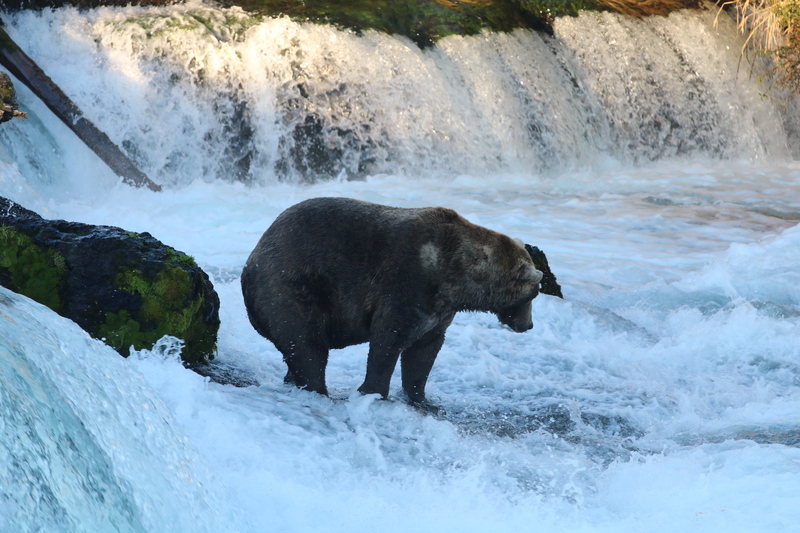 Otis might be the oldest known adult male bear at the river, but other bears at Brooks Falls won’t treat him any differently. After weaning her cubs last spring, 409 Beadnose was single this summer and was able to devote all of her energy into gaining body fat. If 409 is an expectant mother, then she’ll need those extra pounds to produce milk and support the growth of her new cubs. Is Fat Bear Week’s only mother bear plump enough to roll over 854 Divot, a quite chubby female in her own right? Like Beadnose, 854 Divot took advantage of life as a single adult female this summer. If she gives birth in the den, then much of her body fat will be converted into milk and become her cubs’ sole source of nourishment for many months. Without cubs, she’s been willing to visit the falls frequently to take advantage of its fishing opportunities. 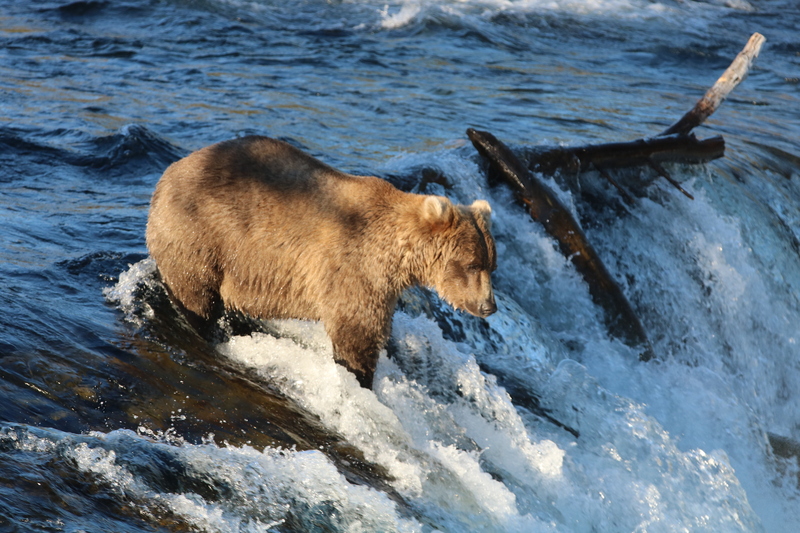 With cubs though, she’s much more likely to avoid the falls and, as she demonstrated in July 2013, sometimes even all of Brooks River. 435 Holly has nurtured two healthy yearlings this year, and the family was one of the most conspicuous on the river. 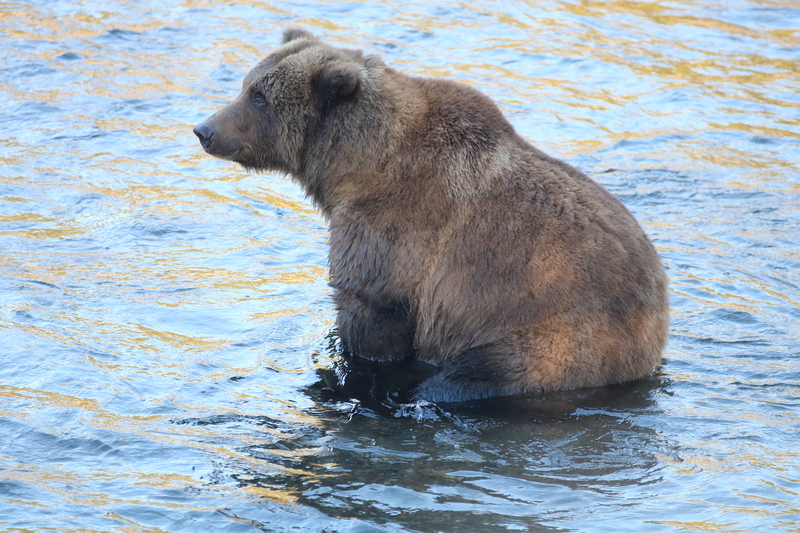 This fall, they are frequently seen scavenging fish in the lower Brooks River area. Milk production and vigilance behaviors (i.e. watching for danger) take precious energy—calories that Holly might have converted into body fat in the absence of cubs. Even so, she remains large and (at least partially) in charge of her rambunctious yearlings. Is that enough to gain the votes to advance past Divot? Two of the river’s largest and most dominant bears meet in this matchup. Both of these large adult males use their size to intimidate other bears and gain access to more mating opportunities and the best fishing spots. In 2017, 32 Chunk was more dominant than 856, who appeared to be injured. This summer, however, 856 reclaimed his position at the top of the Brooks River bear hierarchy. He yielded to no bear and was able to fish where and when he pleased, gaining many advantages in the process. While 856 began to fish at Brooks Falls in June, 32 Chunk didn’t arrive to stay until mid July. Perhaps as large as 856, 32 was able access most fishing spots at the falls without much competition. He regularly yielded upon 856’s approach though. Does Chunk demonstrate the pounds to overcome 856 in Fat Bear Week? If there’s an underdog in the quarterfinals, then 719 is it. She easily was voted fatter than her younger siblings in round one. Now, she faces a true behemoth. 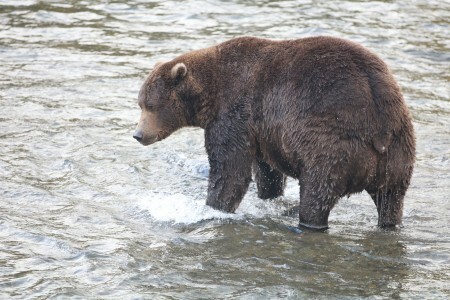 747 is perhaps the largest bear at Brooks River. His size is indicative of his fishing skills. He’s very skilled at fishing in the jacuzzi and near the rocks at the far pool. Like 856 and 32, he’ll use his extra fat reserves to fuel his pursuit of mating opportunities in the spring. 719 is approaching only her fifth birthday, so she has a lot of growing and learning to do. As she enters into adulthood and eventually gives birth to cubs, the skills and knowledge she honed as a younger bear will be put to the test. 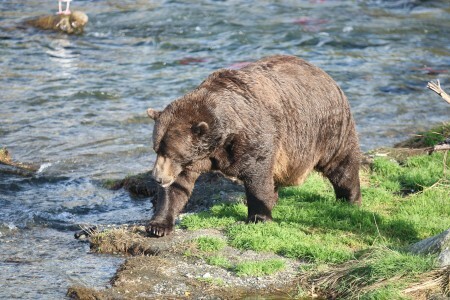 Fat bears are successful bears and they exemplify the richness of Katmai. 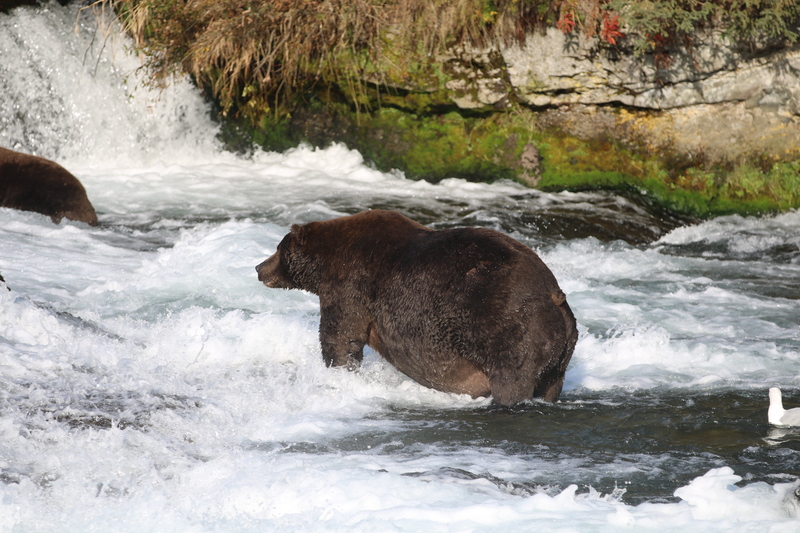 In this way, Fat Bear Week is not just a celebration of fat bears but also of Katmai’s healthy, robust, and productive ecosystem. 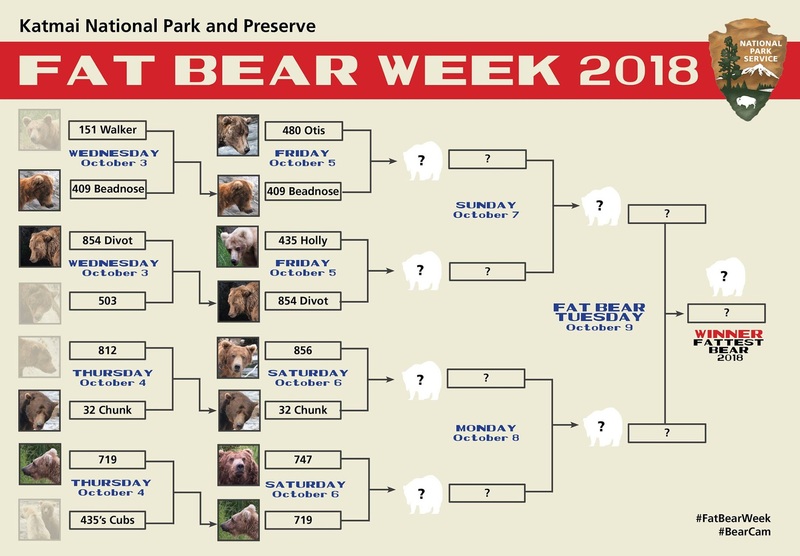 The Fat Bear Week tournament continues through October 9, so please visit Katmai National Park’s Facebook page to participate.